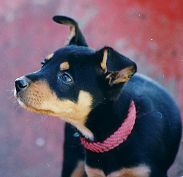 Hi Mary, I've attached a photo of Tikka at nearly 12 weeks old now. Everything is going well. We had her in the crate in the bedroom for the first 2 weeks, now she sleeps on a large dog bean back with a blanket in the hallway just outside our room. She took to it straight away and can do the whole night without any dramas. She will meet a bunch of other puppies on Monday and I will let you know how she gets on. 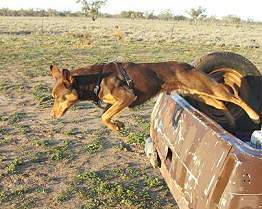 Tracey and I would love to see your other kelpies in action so if it's ok we would like to arrange a visit to your property sometime. 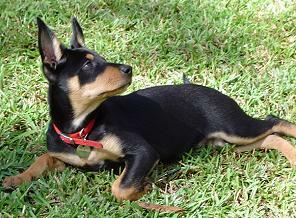 Noonbarra Brock is a handsome young black & tan puppy who was named after Australian racing car legend, Peter Brock. Some time later we worked on a TV commercial with Peter Brock and Noonbarra Dusty III and we told him about his namesake. He was quite honoured and wanted to know about him. I think he wanted to make sure he was a 'good' pup!!! 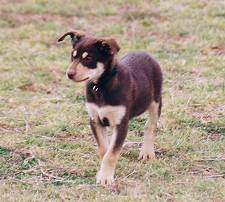 Hi Stephen and Mary, I have attached some photos of Brock and my older kelpie Ella. 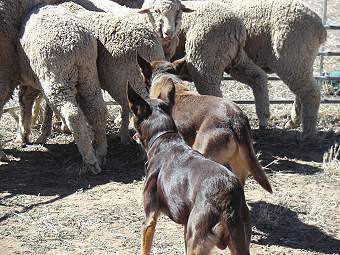 I will let you know how I go with finding training for the sheep dog trials. really well, and has a real personality about him. Most of his time is spent wrestling with Ella, who is starting to become quite protective of him. He is an extremely fast learner, but he is still noticeably a puppy, still quite excitable around others! We have taken him out to Erskine Park a few times now and he has gone quite well. We started him in a small pen with 3 sheep, and now we have him out in the slightly larger yard. There are plenty of people out there who are willing to give us pointers, and so far most people have been really impressed with his ability. Unfortunately we don't really get the time to go out every week, but we try and get out there every few weeks just so Brock (as well as Steph and I!) can have a bit of fun. We tried to take Ella out as well, but she wasn't interested in the slightest. 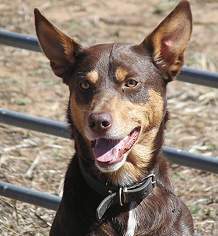 Noonbarra Felix is a nice gentle Kelpie and we have been told is doing very well in Agility Trialling. 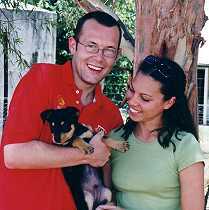 Mark and Felix dropped in in January 2005 for a training session and Felix did amazingly well. Some photos further down. "Thanks for the email and the interest in how Felix is doing. 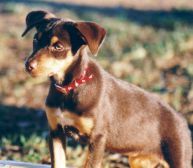 I have told my two work partners (dog owners ) about your technique, and will probably show them this email as I think it explains it very well." "As you probably expect Felix seems to be a very smart boy, it probably took about 4 minutes of the "drop" and put down, before he capitulated, then about every five minutes for 15 minutes he tried to stand up, then off to sleep. Today (his second go ) I 'dropped him (the word I had taught Oscar) and after (as I type) forty minutes he hasn't tried to get up, hard when you are asleep I guess. He also is doing well with 'sit', 'no' and quite well with 'here', I think the other dog helps a lot with this. The down side is I think he has already got it over my wife kylie. If you could be bothered replying I would be interested in knowing if you had done this 'forced down' with Felix before I got him? Noonbarra Felix - a nice happy dog! Mary, Thanks for the info. She has been a wonderful addition to the family. 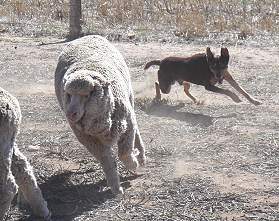 She takes great pleasure in herding the 4 kids instead of livestock and is an extremely bright little girl. Laenie went to a large citrus growing property near Mildura in the Mallee area of the far west of NSW. She has a wonderful life there and is sure to be very spoilt. "A little letter from your "daughter" Laenie. 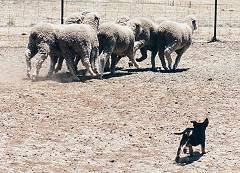 I have settled in well and am enjoying my new life in the Mallee. My siblings have accepted me well. 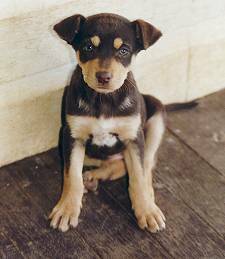 They are big dogs and they allow me to play with them - sometimes they are a little boisterous, but I'm a tough little dog and I love the rough and tumble. They even allow me to chew on their bones. When the think I'm out of line, they growl and gently mouth me but they have not been in the slightest bit malicious. The cat on the other hand is a little different. She s pits at me and even gave me a swipe on the nose. But I get even with her by stealing her food when she's not looking. I have learnt a really good new trick. I can go out and come back in through the cat door. I am very good during the night. The crate is in my parents bedroom and I give a little whimper and they let me out for a wee. Then I have a little cuddle and it's back to sleep. I only have to get up once during the night. that's pretty good. I go to work with my dad every day - I'm the mascot. They all love me and no wonder. I am pretty cute. The backpackers who are pruning the vines make a fuss of me." 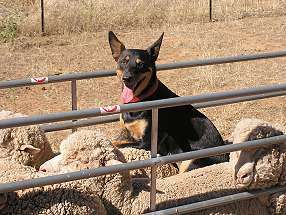 Noonbarra Bobbie was sold to Justin who was CEO of the Ozemail company. 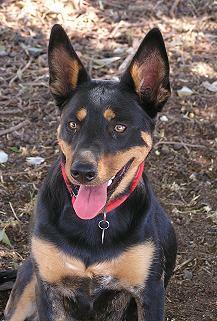 Bobbie was a darling of a pup and very friendly and good natured like all of Max's pups. 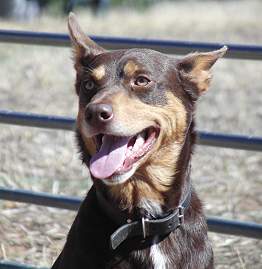 She is a full litter sister to Noonbarra Gemma and a sister in a different litter to Noonbarra Solo. 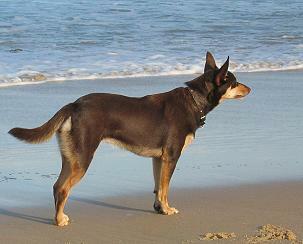 Justin sent us this nice photo of Noonbarra Bobbie enjoying a day at the beach. "I thought I'd let you know that Bobbie has turned into a pretty good dog for us. She is loved by all of course and is totally devoted to the family."